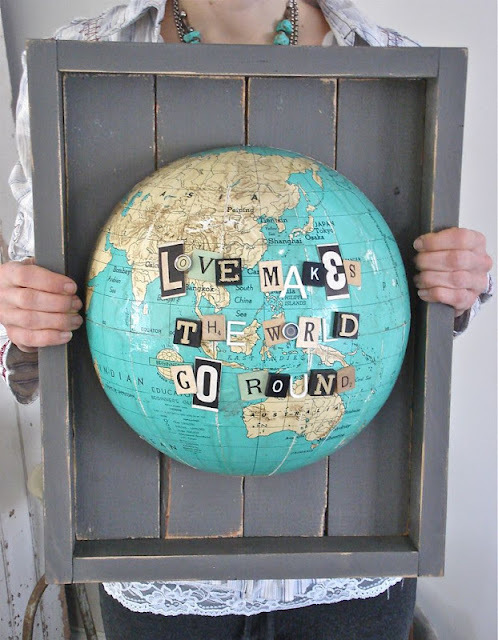 I have had a love for vintage globes for a long time. That love grew even more the first time I went to Paula's house and saw her lovely globe collection. Her collection has two requirements...great color and made before 1948. This is the part of her collection that fit on top of the entertainment center (there are others scattered throughout her house). My collection (can you call 2 globes a collection?) 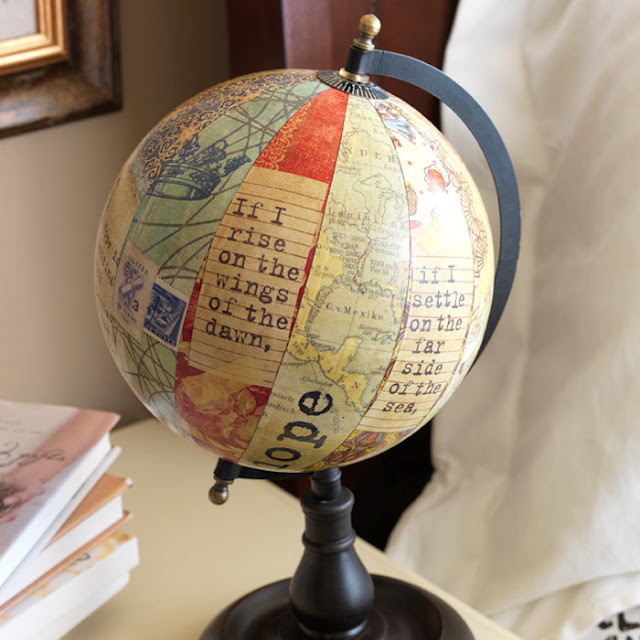 is a work in progress and pitiful by comparison...yes, I have globe envy! Globes add so much to a display. We have used them several times in the 7gypsies booth. This one was a globe that the base was broken. The broken base was removed which left holes in the top and bottom. I used large vintage buttons to cover the holes, attached to jute to hang and applied a large vinyl "7". You could do a favorite quote, scripture or your family name. We also used globes as part of the centerpieces at each table for the lunch at Gypsy Caravan several years ago. Between the two of us we had enough small globes for all the tables (Deb contributed 1, Paula the rest). 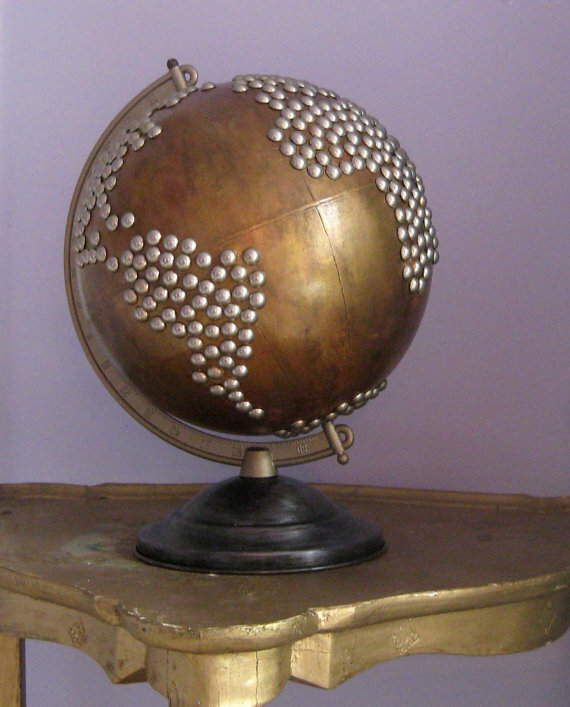 I have admired what others have done with globes and thought you might enjoy them also. This artist, Wendy Gold used vintage globes and recycled materials to decoupage and decorate. This one to announce a marriage date. This one showing the family tree. 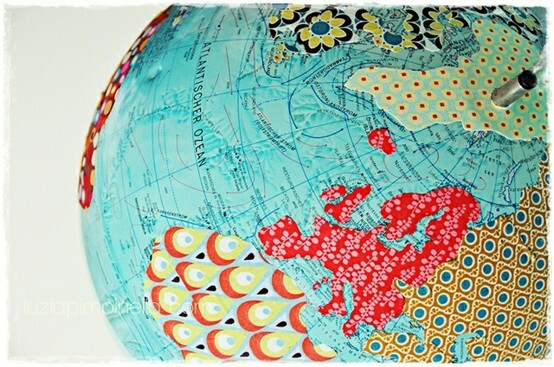 Check out more of her work at Art on Globes, here. 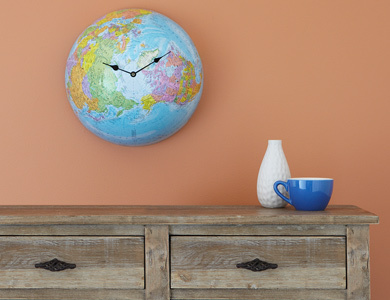 Love this wall clock from Home Made Simple. You could do a series of clocks in a group that represent different time zones and label each with the place it represents. This from The Well Appointed House, but you could DIY with chalkboard paint. Remember the globe that I mentioned above that we displayed in the 7g booth. I'm sorry to say it didn't make it back to my house in one piece. I now have two halves.....I'm thinking of doing this with them! Have a great weekend and see you next week when our good friend Sande Krieger will be back to do another post. Can't wait to see what she has for us!! These are wonderful examples. I do not have a globe but I will be looking. Using those 2 halves for lamp shades is really unique. 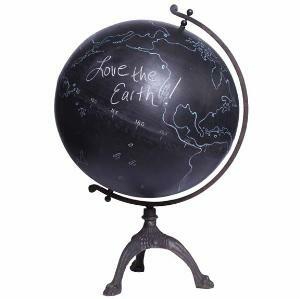 I, too, am a globe collector ... and I confess: it's a passionate, consuming, ageless love-affair! I'm sure once you're bitten by the globe-collecting bug you'll never look back!! 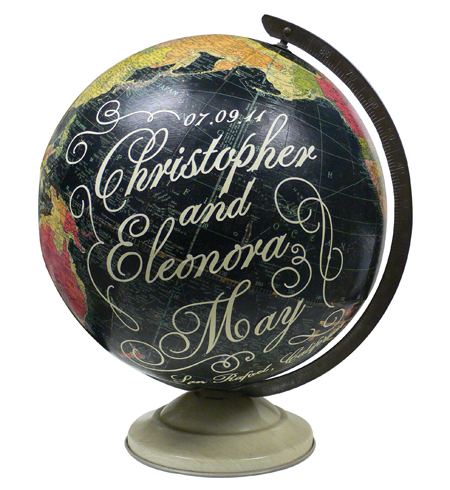 While I really love the altered globes you've shown, I simply cannot bring myself to do the same to those in my collection. I'll have to find some banged-up globes and try altering 'em! Thanks!! You have so inspired me!!! I have a tiny globe that I've had for years and now it is going to be Art!!! Thank you!!!! oh my goodness, i'm so glad i saw this post! such fabulous ideas! 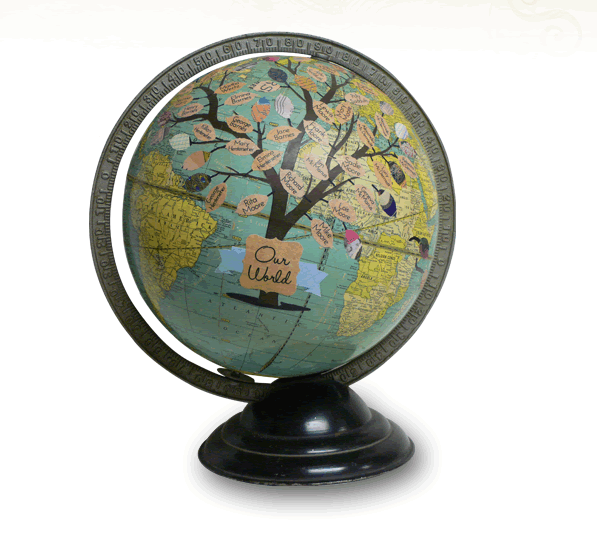 i have an old globe that needs a new purpose and now there's hope for my world! We are globe fans in our home. Our collections is a sad little family of 3, but were always on the lookout to grow them. LOVE the lamp idea. You should do that. Haha! I'm with Deb and Ann. 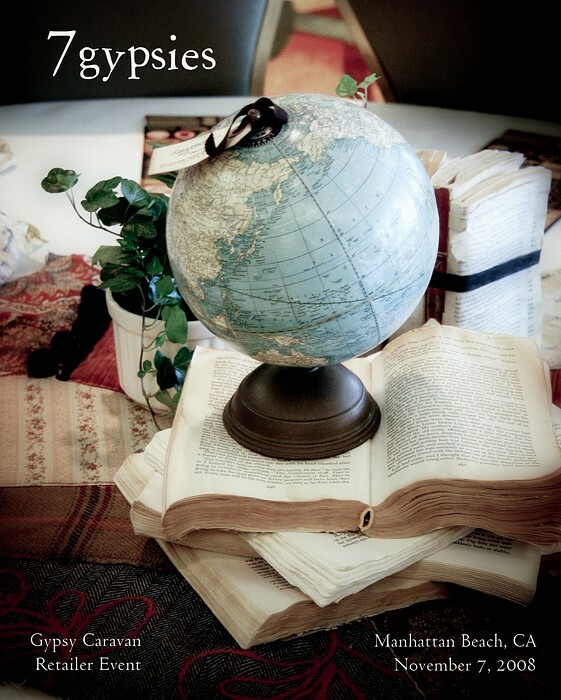 I need more globes so I can try some altering! I have a globe pinterest board, but haven't tried anything I've pinned. So far. Must get on that!! Fabulous post. Such creative ideas. I have been wanting a globe. Now I really, really neeeeed one. I have globe envy too! Thanks for sharing. 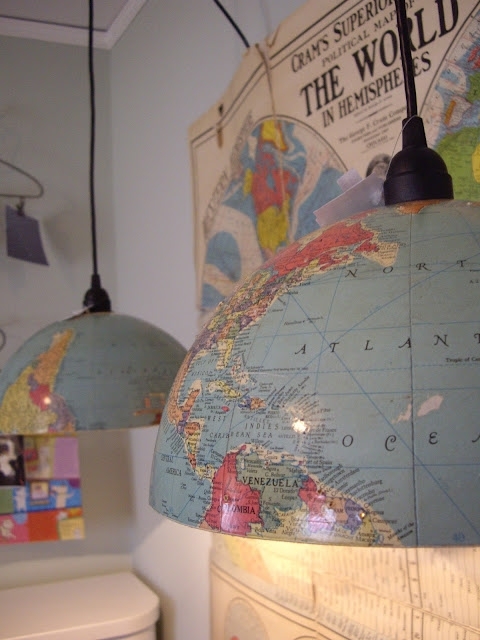 What a great idea to use your broken globe as pendant lighting! I always find fabulous inspiration on your blog. Thanks Deb! I will never look at a globe in the same way again! Such cute projects!! !